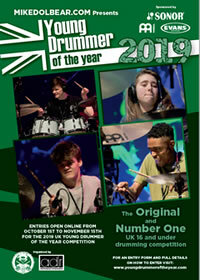 Congratulations to everyone who entered 2019 Young drummer of the Year, sponsored by Sonor Drums, Meinl cymbals and Evans drumheads. Here, in no particular order are the top 40 entries. The final 10 will be announced on Tuesday 11th December. If your name does appear on the list below, please make sure we have your (up-to-date) phone number and email address. The final will take place on Sunday 3rd February at 2pm at the Artrix arts centre, Bromsgrove, B60 1AX. Further details will follow on this website.